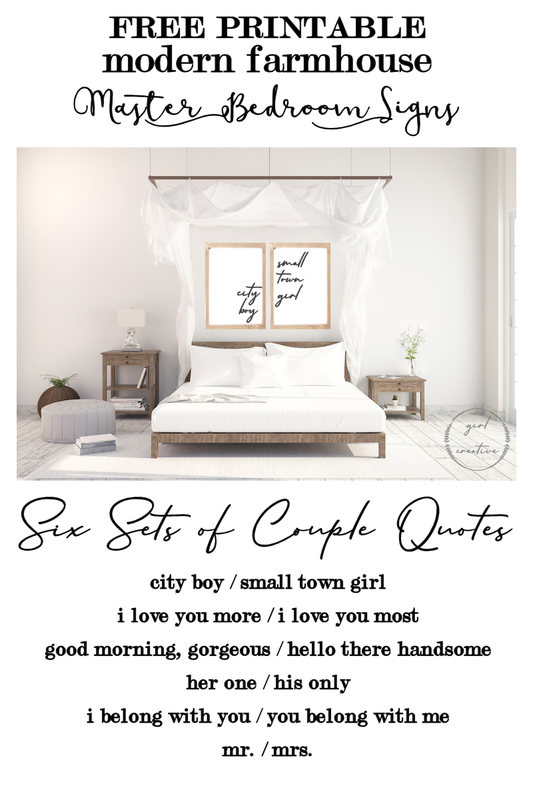 Simple and chic, this collection of Free Printable Romantic Master Bedroom Signs for Above the Bed is just what every home needs. The free prints are perfect for the budget-conscious couple who want to make their bedroom cozy and inviting without breaking the bank. Continue reading blow and find out how you can download all 6 sets for FREE plus snag the FREE cut files for your Cricut or Silhouette. My 1950’s cape cod is a work in progress. We’ve been in this house for 16 years and we are still trying to get everything the way we like it. When we first bought our house there were mirrors everywhere. And I DO mean everywhere. We had them in the living room, hallway, kitchen, stairway, upstairs landing and………the master bedroom! I’m talking wall-to-wall mirrors in there. Even the closet doors were…….you guessed it, mirrors. Man what a chore it’s been over the years to take them all down. The first ones to go were in our master bedroom. I drew the line at sleeping in a room of mirrors. We had no idea what we were doing back then when it came to DIY projects or home improvements. We did a terrible spackle job after we took the mirrors down and painted the bedroom lavender. We didn’t just paint it lavender but we did a faux finish on the bottom paired with a floral border around the center of the room. Thankfully I don’t have any pictures kicking around because that is not a bedroom I ever want to remember. Back in 2011 our house had some damage from Hurricane Irene. There was a leak in our roof which lead to a leak in our master bedroom. It was then that we finally ripped out the sheet rock (something we should have done after we took the mirrors down) and re-did the bedroom. I wish I could say we wound up with a gorgeous new romantic master bedroom but ummmm, no. Since then the only thing we managed to do was prime the bedroom. But finally. FINALLY we are going to paint it. We are going to make this project our baby. It’s going to be our trial and error room. Our learning room. No one sees it but us and wanting to improve on our DIY skills, we are going to use this room as a test space of sorts. I’ve given up on the perfect bedroom for now. And truth be told, anything is an improvement from what it looks like now. With that said, I knew I needed to go in there with a plan. My husband and I tend to knock heads when it comes to home decor. We both have very different ideas on what we think looks great. 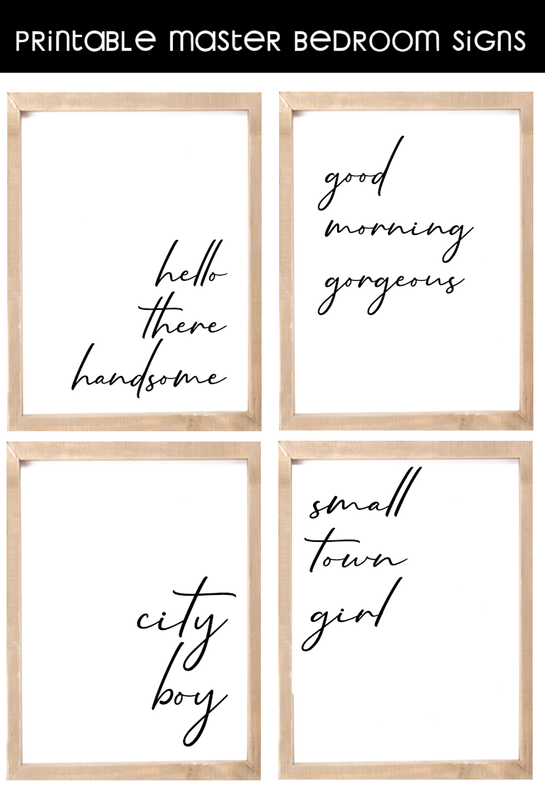 One thing I definitely plan to incorporate into our modern farmhouse master bedroom makeover is a set of these free printable signs for the master bedroom. I’m not sure just yet which ones I’ll chose but I know that my room will not be complete without a pair. There are 2 different ways these designs can be used. You can print them out and frame them. If you want signs larger than 8×10 you can have these couples signs printed at Staples as engineering prints. They are 18×24 and you can pick up frames at Hobby Lobby using their 40% off coupon. Right there you will save a ton of money. If you want to get a little more creative then you can use the SVG cut files with your Cricut or Silhouette and make your own signs out of wood or canvas and build your own frame. If that sounds appealing to you, you can find out how to do that in this post. To find out where to get more great FREE SVGs, Here’s your Go To Guide. 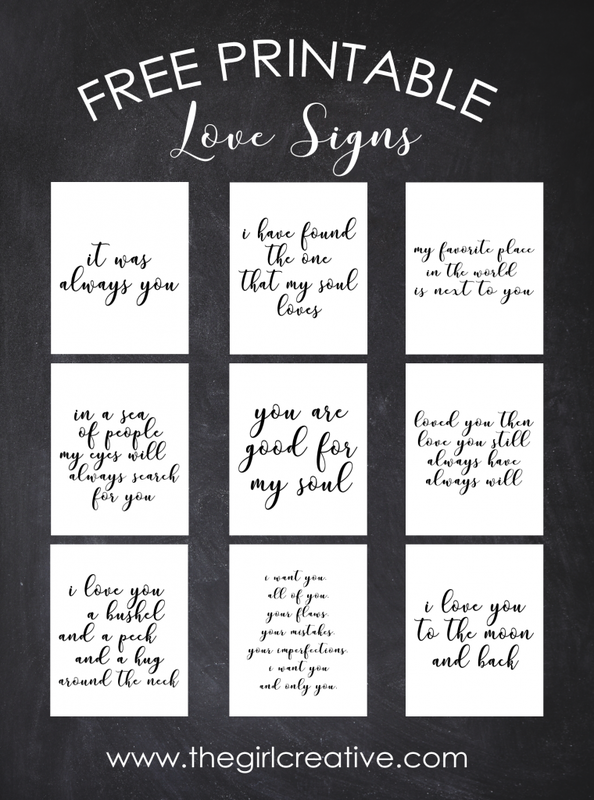 If you aren’t into matching signs for your Master Bedroom but would love some framed romantic art then you’ll want to see our popular collection of Love Quotes.